The Slimfocus is the sleek result of a quest for aesthetic fluidity, minimum volume and excellent heat performance. A revolution in contemporary fireplaces, the Slimfocus is an assertive presence, a periscope of fire that synthesises a whole philosophy. The Slimfocus is the first suspended sealed fire. Compatible with low-energy buildings, it draws in air for combustion through the smoke evacuation flue (balanced flue system). It can equally be installed in traditional homes, drawing in air from the room (open flue system). 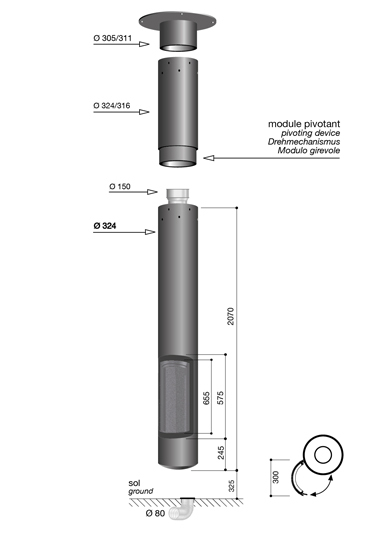 Guaranteed good functioning with a minimum flue length (interior plus exterior) of 3,8 m if connected to a balanced flue chimney.